On Mars, the most striking topography occurs around the equator. The planet's low latitudes are dominated by the Tharsis plateau, which hosts several towering volcanoes. Not far off sits the solar system's largest – Olympus Mons. Near the Eastern fringe, however, things start to get deep. 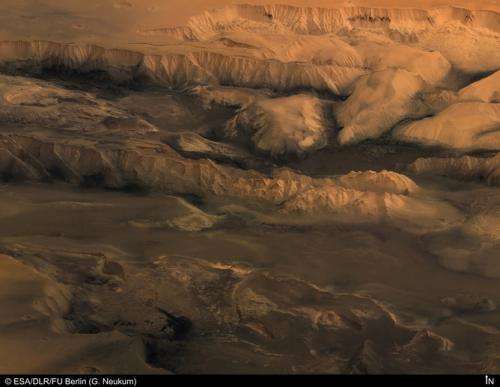 There the land dives into a winding maze of valleys and river-like "outflow channels", the former including the 4000km-long Valles Marineris – the "Grand Canyon" of Mars – which exceeds its terrestrial namesake in every dimension. These great gouges are widely thought to have been formed, at least in part, by flowing water. But according to recently published research, they could have had a very different genesis, linked to the volcanoes to the West. A paper by Giovanni Leone of the Swiss Federal Institute of Technology, published in the Journal of Volcanology and Geothermal Research, suggests that the martian valleys and outflow channels were in fact formed mostly by lava flows, which erupted from the Tharsis plateau in the planet's distant past. To draw this conclusion, Leone scrutinised thousands of images from NASA's Mars Reconnaissance Orbiter (MRO) spacecraft, which has been orbiting the planet since 2006. This allowed him to map the floors of the equatorial valleys and outflow channels at an extremely high resolution of up to 25cm per pixel. These images appear to show extensive lava flows draping the floors of many of the valleys and channels. Around 90% of the floors look to be covered either by lava or by lava-related landslides. The morphology of the lava flows Leone encountered suggest that the lava actually incised the valleys and channels in the first place. The MRO images seem to show that channels formed by the freshly erupted lava were later deepened and widened by the passage of liquid rock. This type of erosion, Leone argues, can explain the existence of the valleys and outflow channels without the need to invoke significant amounts of liquid water. The valleys and outflow channels are believed to be many billion years old. Leone believes the lava would have been emitted by now-vanished volcanoes somewhere on the Tharsis plateau, forerunners of the region's (relatively juvenile) modern volcanoes. Leone believes that every stage of this volcanic erosion process is visible in the MRO images. The first stage, he concludes, can be seen in the locations closest to today's Tharsis volcanoes, at the western end of Valles Marineris. Here lava tunnels seem to have collapsed, forming "pit chains" – long curvilinear depressions in the crust. Further east, where the terrain deepens, the pit chains seem to have been further eroded, by the injection of yet more lava, into more extensive channels – first into "fossae" and later into larger "chasmata". The MRO images showed relatively little evidence for the past presence of liquid water in the valleys and outflow channels, which can be inferred by the presence of "light toned deposits" in the images. This, Leone believes, adds further weight to the theory that these features are igneous in origin. These are radical conclusions. While a volcanic origin for Mars' valleys and outflow channels had been proposed before (in the wake of NASA's Viking mission in the 1970s, this was actually the prevailing theory), for the past 25 years, scientific opinion has drifted towards an explanation involving a mixture of tectonic uplift and sedimentary erosion caused by water. The distinction between sedimentary and igneous rocks reaches far beyond geology. If, as the majority of scientists still believe, the valleys and outflow channels once contained significant volumes of water, then they are naturally prime candidates for future missions on the hunt for life. For instance, the European Space Agency's ExoMars rover, due to touch down in 2019, is considering landing sites around Valles Marineris. If Leone's conclusion is accurate, however, and these features are instead mostly volcanogenic, this implies that much less water was present during their formation. If this turns out to be true, their suitability as landing sites could be called into question. This would not spell doom for the chances of finding life on Mars. If Leone is right, it simply means that less liquid water existed in this particular corner of the planet. It would say little about Mars' total water inventory. In any case, this study is unlikely to change the ESA's travel plans. Leone's research, while intriguing, is far from conclusive. It is notoriously tough to tell between igneous and sedimentary rocks using orbital images, even at the resolution offered by the MRO. A definitive answer, then, will have to wait. But let's hope not at the cost of another expensive mission which comes up dry. If one wants to solve the problem of Martian canyons (or any canyon throughout the solar system) one will need to go even harder against the current. They are not radical conclusions. The Cayman Trench (3 miles straight down) is antipodal to the Deccan Trapps in India. Does this not lead to the conclusion that a massive blast sundered the Caribbean with reverberations antipodally? The Earth is unique in the planetary bodies in having an extremely thin lithosphere. This I propose is due to the Moon's birth in a previous explosive event due to a heated core release. This left Earth with many fractures in the lithosphere interpreted by science as plate tectonics, it is not. But this allows the heated core to release safely. Except of course, the life on the surface is exposed to excessive radiation, radon gas, etc. Which again is interpreted as evolution, it is not. Both Mars and Venus have thick lithospheres leading to stationary events creating such as Olympic Mons and Maat Mons. Their heat lacked sufficient water to blast outward. Interesting prediction for the Tharsis area, and especially the hard to predict Valles Marineris! Curiosity has now shown that some of the outflow deposition fans are indeed done by water. And the equatorial lava flows doesn't move the putative vast northern ocean, as the article notes, that has several constraints (hydrogen marking ices, ices, deposition fans and coastal features. Instead, a heafty early heat flow and the emitted volcanic gases adds likelihood of then thick, habitable, atmosphere and now continued subsurface habitability from liquid water. If one wants to solve the problem of science offending ones magic beliefs one will need to go even harder against the current. @katesisco: I'm not sure what you are on about e, but the accepted Tellus-Theia collision which spawned Tellus-Moon predicts the observed orbital momentum. Your "explosion" (?) does not. And FWIW, no known explosion mechanism with the material at hand (mostly iron, some silicon, very little volatiles) can launch the requisite 5+ km/s shock waves and that much mass. So presumably, from scant evidence, our lithosphere is not extraordinarily thin for a body retaining plate tectonics, the process that decides our lithosphere thickness. The history of "explosions" making Moon is long and torturous. Darwin (yes, a grandchild to _that_ Darwin IIRC) thought Earth could have spun off Moon. Latest Velikovsky AFAIK was dabbling in it, long after it became non-viable from looking at orbital mechanics. Katesisco is suggesing a high velocity impact that sent much of its energy through the earth and when the wave recombined at the opposite side, it cracked the surface like an eggshell. They are not radical conclusions. The Cayman Trench (3 miles straight down) is antipodal to the Deccan Trapps in India. You might Google Island Arc and Tectonics before spouting gibberish. It is possible that impact event which created moon could have alterd the then ongoing earthly tectonics, but those self-initiating tectonics were already extant. This you would know if you engaged in a thorough study of the available evidence. As for similar events for Mars and Venus, you already point out their much thicker lithospheres. Where is the evidence of the therefore proportionally larger/faster antipodal impactors required to generate that much greater force to produce the effects you are claiming are evident on Mars and Venus? My mouse fell off it's pad and I gave you a 4 when it should have been a 5.